With increasingly smaller returns from improving the speed of the actual gear grinding process, improving your setup time has become a primary way to keep improving efficiency. Here's the latest on how you can do that today. Software Providers Examine the Dynamic Behavior of Gear Noise. Designing and sizing a rack-and-pinion system, per AGMA and ISO gear calculation. "Documentation is not a Substitute for an Intuitive Interface." The author explores the development of modern controls for a CNC gear grinding machine. 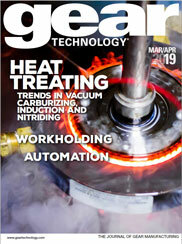 Say 'YES' to getting the best and latest in gear industry technical information and news. Resubscribe now to Gear Technology. New grinding machines, multi-tasking machines, gear software and tools for gear manufacturers. A reader asks: We are currently revising our gear standards and tolerances, and a few problems with the new standard AGMA 2002-C16 have arisen. Firstly, the way to calculate the tooth thickness tolerance seems to need a "manufacturing profile shift coefficient" that isn't specified in the standard; neither is another standard referred to for this coefficient. This tolerance on tooth thickness is needed later to calculate the span width as well as the pin diameter. Furthermore, there seems to be no tolerancing on the major and minor diameters of a gear. Remembering Panhard and Levassor, the company that invented the first manual transmission.